An injury has thrown the New York Yankees rotation into a state of flux once again. On Monday, the Yankees placed C.C. Sabathia on the 10-day DL due to knee inflammation. Reliever George Kontos was called up to take Sabathia’s spot on the roster. However, it also opens a spot in New York’s rotation. The timing of Sabathia’s trip to the DL is unusual. It comes just one day after the lefty threw six scoreless innings in a win against the Rangers. It was easily Sabathia’s best start of the season. He allowed just one hit and three walks while striking out seven. The only hit he allowed was an infield single to Joey Gallo. On the player, Sabathia went to ground to field the ball and landed on his knee awkwardly. However, he obviously showed no ill effects right away, as he didn’t give up a hit the rest of the way. The issue appears to be a flare-up of a degenerative knee condition Sabathia has dealt with for quite some time. He also went to the DL around this time last season with knee inflammation. Sabathia was able to come back from the DL as soon as he was eligible and finish the season strong. The Yankees can only hope he’s able to do that again this year. In 22 starts this season, Sabathia is 7-4 with a 3.32 ERA. Even if it’s a short-term absence for Sabathia, this is not a good time for the Yankees to lose one of their starts to injury. 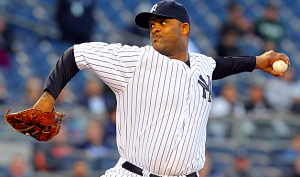 New York will need to replace Sabathia for at least one turn through the rotation. Luis Cessa will be given the task of filling in for Sabathia’s next scheduled start. In three starts this season, Cessa is 1-2 with a 3.14 ERA. With Cessa starting, the Yankees declined to send Sonny Gray back into the starting rotation. Gray was demoted to the bullpen earlier this month amidst continued struggles. If Sabathia ends up missing more than one start, top prospects Chance Adams and Justus Sheffield could get a chance in New York’s rotation. At this point, there’s no reason for the Yankees to be worried about Sabathia’s long-term health. But if they have any hope of catching the Red Sox in the AL East, they need to stay healthy. Sabathia is also critical to the team’s postseason success this year. They need him to be healthy and at his best coming down the stretch. This latest trip to the DL casts at least some doubt on whether Sabathia will be 100% the rest of the way.